From the leading maker of agricultural equipment chiming in after announcing layoffs this summer to a pair of recent tech initial public offerings hoping to impress investors with quarterly reports, here are some of the things that will help shape the week that lies ahead on Wall Street. Two California-based upstarts will be reporting on Monday. Workday (WDAY) and Palo Alto Networks (PANW) will be posting quarterly results after the market close. Workday provides Web-based enterprise software for finance and human resources. Palo Alto Networks offers cybersecurity protection for company networks. Workday and Palo Alto Networks went public just months apart in 2012. Early investors have done well. Shares of Palo Alto Networks have more than doubled since going public at $42, and Workday stock has more than tripled since going public at $28. Analysts see strong sales growth at both companies for the Monday afternoon reports. They also see strong bottom-line growth at Palo Alto Networks, but Workday has yet to turn the corner of profitability. Campbell Soup (CPB) reports on Tuesday morning. There's more to Campbell than its namesake cans of soup. Pepperidge Farm cookies and cakes, Pace salsa, Prego pasta sauce and V8 juices are just some of its popular brands. Wall Street sees revenue climbing 3 percent to $2.2 billion, but they see a bigger gain on the bottom line. Analysts are holding out for net income of 72 cents a share. It earned just 66 cents a share a year earlier. Things have not been harvesting according to plan at Deere & Co. (DE). The farm equipment giant announced this summer that it would be reducing its agricultural equipment production for the balance of the year, and it backed that up a few days later by announcing layoffs. 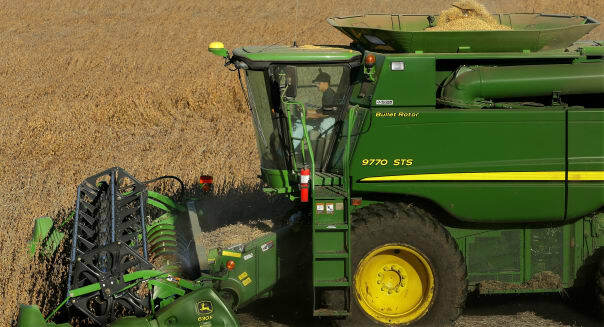 We'll get a glimpse of how Deere is holding up on Wednesday when it reports fresh financials. It probably won't be pretty. Analysts see revenue taking an 11 percent hit with earnings per share plunging 26 percent. Since we already know that things aren't going well, the one thing that will drive the stock higher or lower will be Deere's guidance. It's Thanksgiving on Thursday. This is normally a time for family gatherings, enjoying sumptuous meals, catching football on TV and reflecting on things to be grateful about. However, don't be surprised if a few family members duck out earlier than usual. More and more retailers are pushing their Black Friday sales to Thursday night. Holiday purists naturally lament the trend, but store operators wouldn't be doing this if the public wasn't showing up for the sales. The market opens for an abridged trading session on Friday, but with traders picking at leftovers it's a safe bet that the market will be quiet. Shoppers will gravitate to Black Friday doorbuster deals, but another big attraction during Thanksgiving weekend will be the corner multiplex. "Horrible Bosses 2" and DreamWorks Animation's (DWA) "The Penguins of Madagascar" will likely be the two big draws over the weekend. There's a lot riding on the latest entry in the Madagascar franchise at a time when DreamWorks Animation is rumored to be buyout bait. The same chatter indicating that Hasbro (HAS) was in talks to acquire DreamWorks Animation went on to claim that the talks broke down, but you never know if another hit movie out of DreamWorks may fuel new buyout buzz. Motley Fool contributor Rick Munarriz has no position in any stocks mentioned. The Motley Fool recommends DreamWorks Animation, Hasbro and Palo Alto Networks. The Motley Fool owns shares of Hasbro. Try any of our Foolish newsletter services free for 30 days. To read about our favorite high-yielding dividend stocks for any investor, check out our free report.